Sean Vice, owner of Vice Brewing Company in Grants Pass, Oregon, looks like the kind of guy you want brewing beer. Plaid shirt, A large smile, friendly eyes, and impressive beard. He moves with a steady purpose, and knows a lot about his main product. The brewery smelled wonderfully of beer malts. He poured me a sample tray and we talked beer for a couple of hours. He started the business just over six months ago, officially. He’s been brewing for the past ten years as a hobby, honing his craft and finding styles he enjoys. A friend once told me that there was no substitute for time invested, and for Sean and his beer, it shows. His establishment is well furnished with plenty of tables, a couple of arcade cabinets and board games to boot. He had a few IPA’s (as all breweries do nowadays) but it was obvious to me Sean’s love for styles were the less explored. E.S.B.’s, a Pumpkin spiced beer, Milk Stout, Cascadian Dark Ales and the like. I got a six-beer sample tray. I tried his E.S.B. and was incredibly impressed. Like most E.S.B.’s, it wasn’t necessarily bitter, but here its hoppy flavor was very, very mellow. It tasted full bodied, with a bit of strawberry sweetness. Wonderfully delicious. The Sith Dark Side CDA was a lovely mix of the strong flavors of a stout and poignant flavors of a pale; a dry malt flavor with a bit of hoppiness. His Kahlises wheat was a nice easy flavor, thirst quenching and left me wanting more. But best of all was his Nightmare of Vice Milk Stout. A deliciously creamy stout, made with milk lactose, the milk chocolate flavors it had hit all the right notes for a good dessert beer without being over the top. Easily one of the best stouts I’ve ever had. Additionally, Sean brewed a Resilience IPA as part of Sierra Nevada’s Camp Fire relief project, where 100% of the beer’s profit goes towards relief for the California wild fires. Very cool. Vice Brewing Co. also serves roughly a dozen cocktails, using almost exclusively Oregon Local spirits like Spiritopia, Immortal Spirits and Wild Roots. I couldn’t have any (I had a 45 minute drive home and the Milk Stout I’d greedily pounded sat at 8.2%) but their Old Fashion and Mule looked amazing. 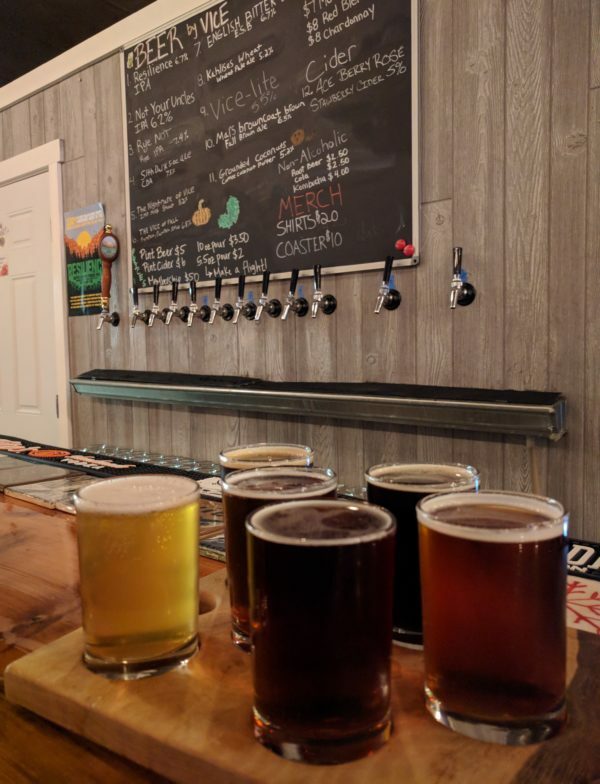 If you find yourself in Grants Pass, stop by Vice Brewing Co. There’s plenty to do if you’re with friends, or if you’re by yourself spend some time playing the arcade or belly up to the bar and talk beer with Sean. You won’t be disappointed.